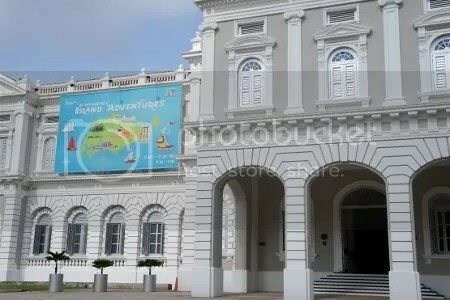 We embarked on Island Adventures at the National Museum of Singapore on Wednesday and it was so much fun! 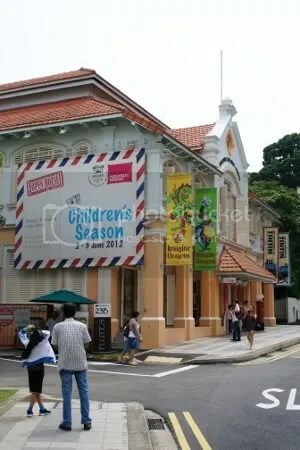 This is part of Children’s Season 2012 and is on till 22 July. We started at the last stop first because it’s impossible for Anya to walk by a colouring station without sitting down and taking part. 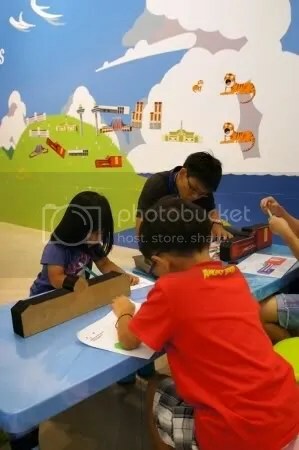 She picked a picture of the National Museum to colour and then spent some time sticking magnetic pictures of historical buildings onto the wall. While she was doing that, I stood around and read about some of the featured buildings that are no longer around, such as Van Kleef Aquarium, National Theatre and the old National Library building. It’s sad that Anya won’t be able to go to the same library that I went to as a kid! Then it was Ahoy! All Aboard! 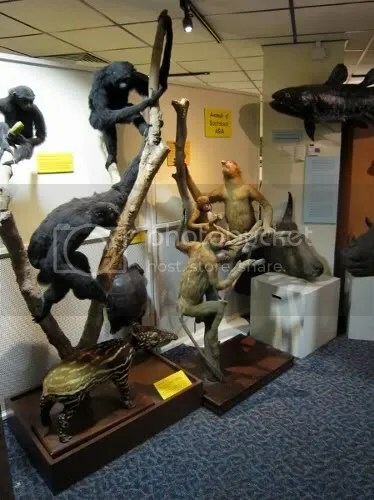 as we went onto a ship to learn about the travellers that visited Singapore in the 19th Century, the things they brought along with them and the obstacles they had to overcome to get to Singapore. 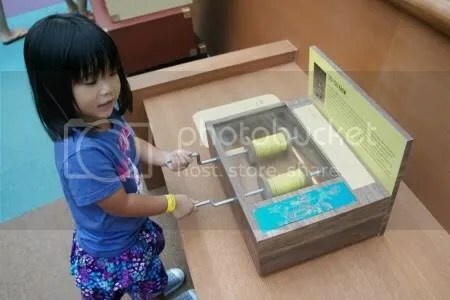 This section was quite interactive: children could spin threads, turn a turbine to generate electricity, try spelling out words on a telegraph, play with gears and excavate coal and precious stones. 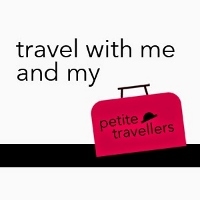 There was a small room with a map to show where the travellers came from and how they sailed to Singapore and then some peep holes to see the challenges that were faced by the travellers. After disembarking, we arrived at the Port City to experience life in the early days of Singapore’s growth and development. 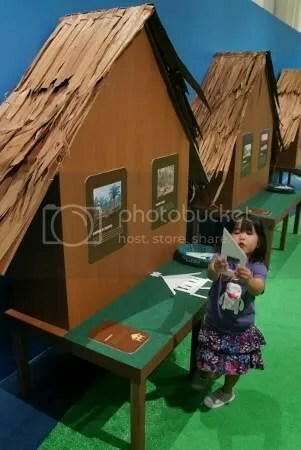 Anya tried building a little kampong house, caught a lot of fish as a fisherman, mended shoes as a cobbler, cooked noodles as a roadside hawker, carried things up and down the ship as a coolie and wrote some gibberish as a letter writer. Then she did everything again. And again. She could have stayed in there forever! what’s in box number one? Anya had a great time and she’s asked me to bring her again and I just might since there’s still about a month to go before it ends! Entrance to Island Adventures is $5 but there’s free admission today and tomorrow (23 & 24 June) and on 21 & 22 July. 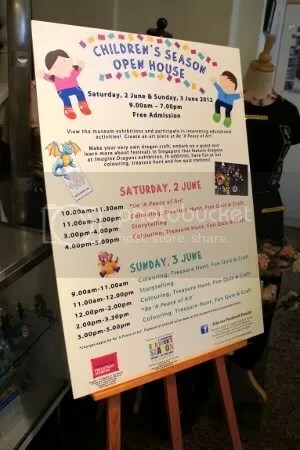 There will also be roving acts with mysterious characters to meet, craft activities and storytelling sessions on these days. 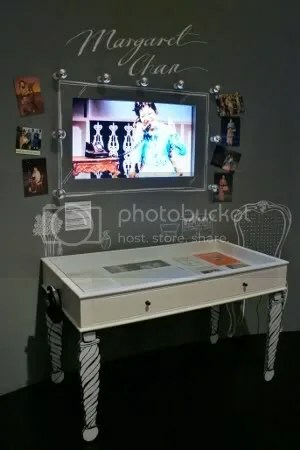 This entry was posted in Uncategorized and tagged children's season, museums, nostalgia, play on June 23, 2012 by delphine. 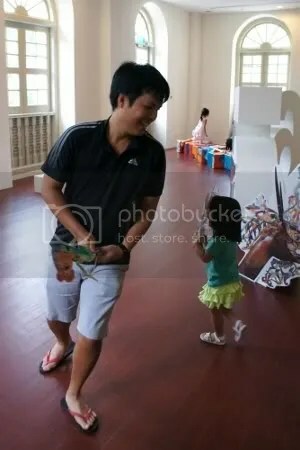 We went to the Peranakan Museum today for their Children’s Season 2012 Weekend Festival. It was quite packed but we managed to do some activities and walk around. 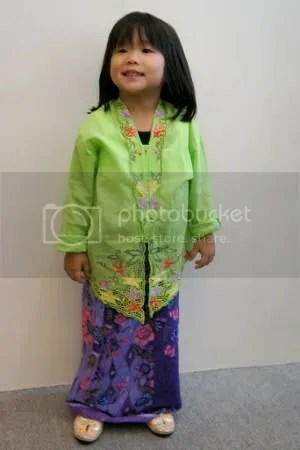 Firstly, we got all dressed up in sarong kebayas. We bumped into Susan who was there at the same time and we took some photos together. 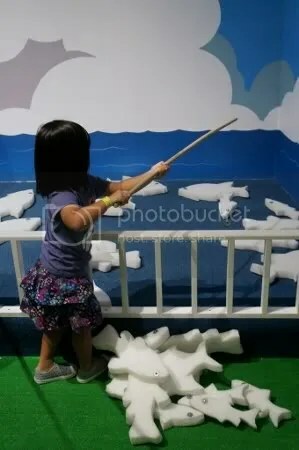 Last year, they had a nice backdrop that people could take photos against but the activity room was quite a crowded mess this year and we had to take our photos in some random small corner. 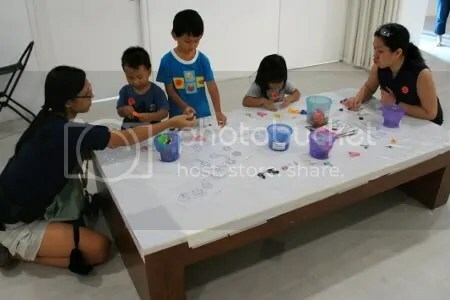 There was a puppet making activity but we decided to give it a miss since we just did something similar at ACM the previous week and we also skipped the pineapple tart making session. But we did some printing and stamping and Anya tried playing congkak. I think she was more interested in the marbles than in how to play the game properly! We also sat in for a storytelling session and A Peek into the World of Puppetry. 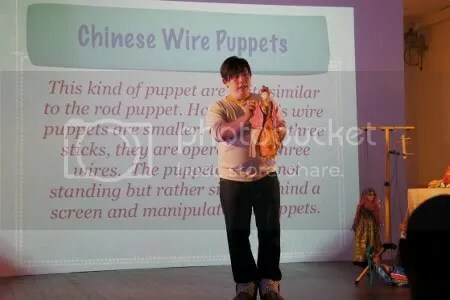 The latter was an interesting presentation on various puppets and there were video clips to show the puppeteers in action. Anya was quite fascinated by all the different types of puppets. 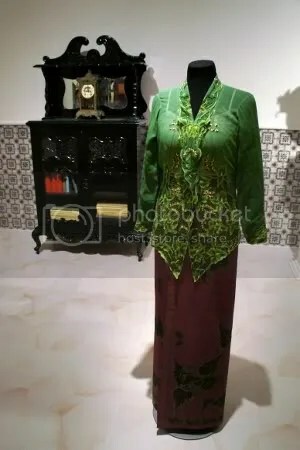 I really like the current Emily of Emerald Hill exhibition that blends Peranakan outfits and furniture with costumes, photographs and lines from the play as well as Stella Kon’s own photographs and other materials. We watched Margaret Chan as Emily at Victoria Theatre two years ago and it was a fantastic performance. 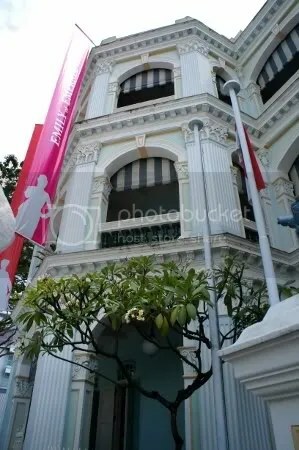 I hope to go back to Peranakan Museum and spend more time looking at the exhibition without the kids around! 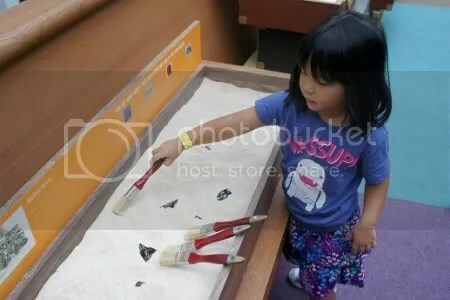 I’m wondering why all the Children’s Season activities (except the ones at National Museum and SAM) are only being held on the weekends when they should be spreading out to some of the weekdays since it’s the school holidays. 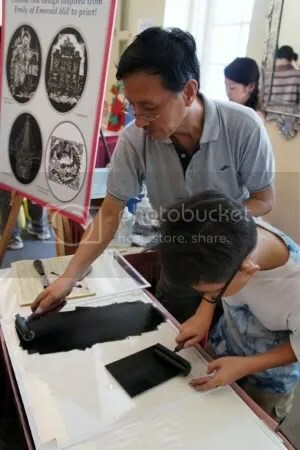 I’m sure there are parents who are not working or who have taken leave for part of the holidays so perhaps the activities can be from Friday to Sunday so that it won’t be crazy crowded the entire weekend. 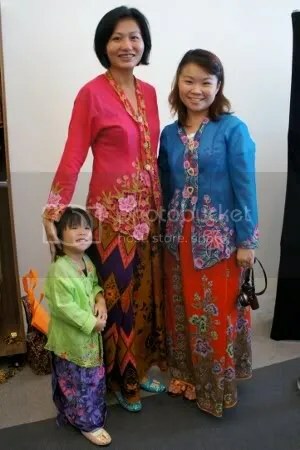 Peranakan Museum had Drop-In Wednesdays during the Children’s Season last year and they were very well-attended. 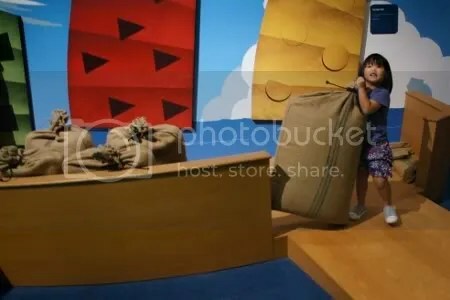 I really hope to see more Children’s Season activities being held on weekdays next year. 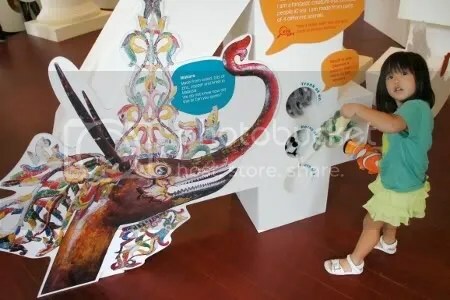 The Peranakan Museum Children’s Season Weekend Festival continues tomorrow, 17 June, from 12-5pm. 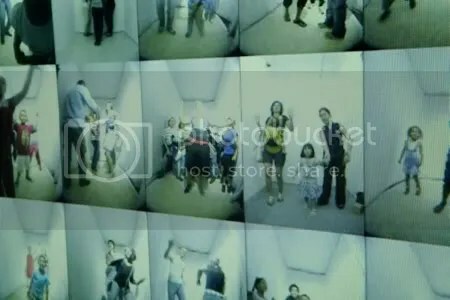 This entry was posted in Uncategorized and tagged children's season, museums, outings, performances on June 16, 2012 by delphine. 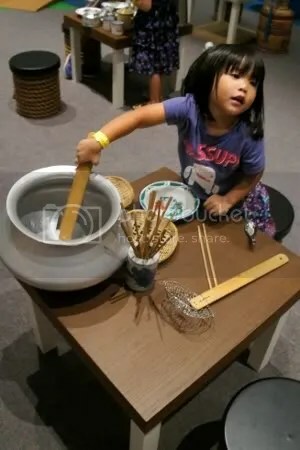 We went to the Asian Civilisations Museum today for their Children’s Season 2012 Open House. It was incredibly crowded!! 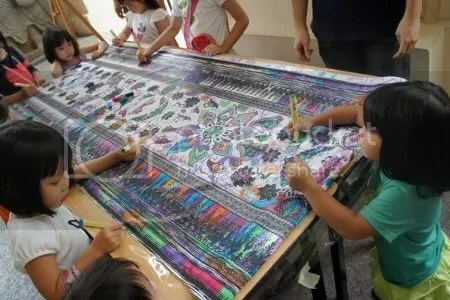 There were many activities for the kids including craft, dress-up, guided tours and some cultural performances. We got there at about 2.30pm and wanted to register for a guided tour but the tours were booked solid till 5pm so we went to do some craft at the River Room instead. There were SO many children in the room and we only managed to make a shadow puppet. Wanted to do some pottery but there just weren’t enough seats. 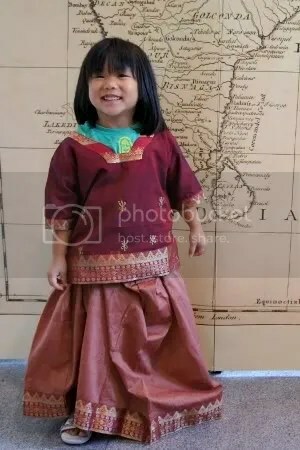 After the craft activities, we went down to the first floor and Anya dressed up as a little royal princess. 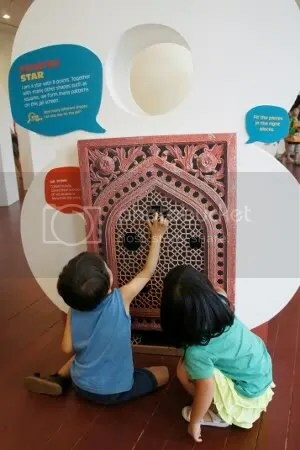 Then we went to explore Count to Ten!, a very kid-friendly hands-on gallery for children to learn about Asian culture. Anya had quite a bit of fun in that little room. what would Marco Polo do? We wanted to walk around the galleries but it was a bit too crowded for our liking so we decided that we would probably go back another day! 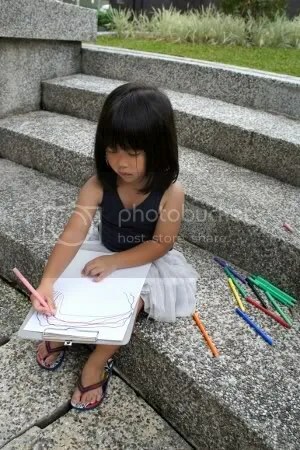 After doing a little bit more colouring at the entrance of the museum, we went off and had ice-cream. The Asian Civilisation Open House continues tomorrow, 10 June, with free admission from 9am to 7pm and activities from 1-6pm. 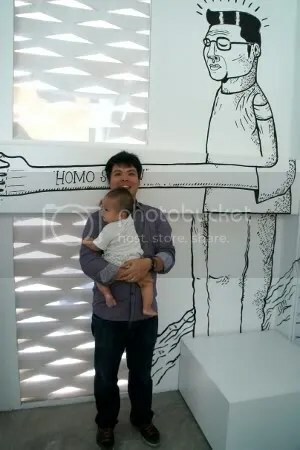 This entry was posted in Uncategorized and tagged art, children's season, museums on June 9, 2012 by delphine. 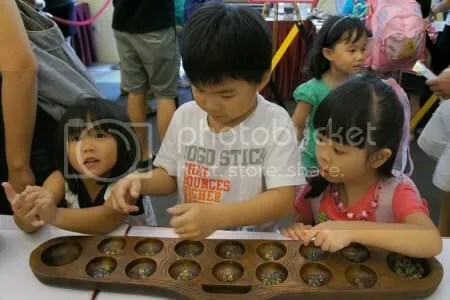 We went to the Singapore Philatelic Museum today for their Children’s Season 2012 Open House. 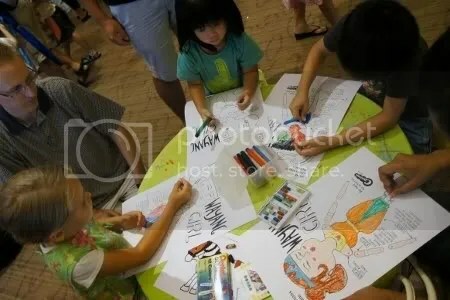 There were craft activities, quizzes and storytelling for the kids. 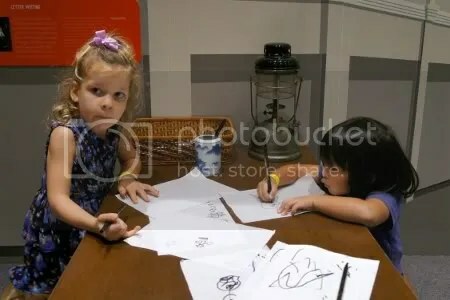 Anya was initially quite keen to do some colouring for her dragon puppet but was disappointed that there were only colour pencils available. She’s not so good with or interested in colouring with colour pencils so I ended up making most of the dragon puppet on my own! 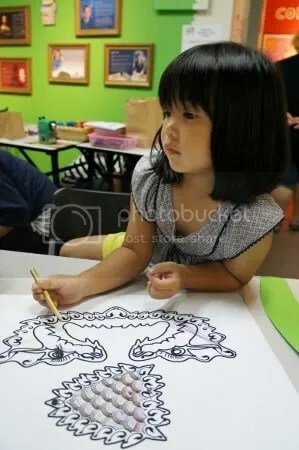 The craft activities are more suitable for older kids because the dragon pictures are quite complicated to colour and there’s some cutting involved. We enjoyed walking around The Adventures of Tintin and Imagine Dragons exhibits. 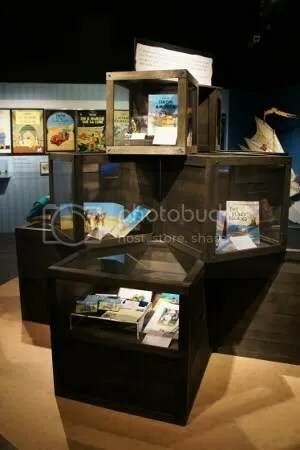 I must confess that I haven’t really read any Tintin comics but I think the exhibit is very interesting! There’s a good mix of stamps, books and even toys put together and I think the centrepiece of rugged-looking crates really adds to the atmosphere. 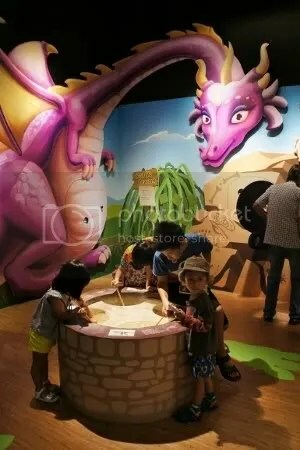 I love how they use stamps to explore the different myths and legends of dragons from all over the world in the latter exhibit. 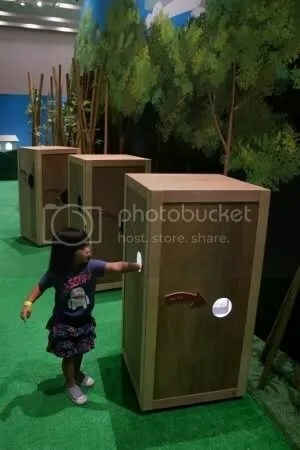 The exhibit is also quite interactive with stamp magnets to move around on a world map, little doors to open and close, cubes with velcro to stick onto the wall, etc. Anya’s favourite bits were the dragon boat and the little archaeological dig station. 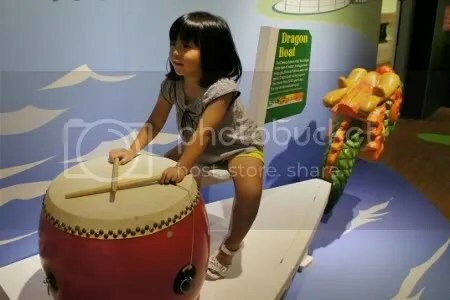 She heard the dragon boat drum from the 1st floor and was very excited to climb on and beat the drum to her heart’s content. She also went quite mad excavating dinosaur bones so we literally had to drag her away! 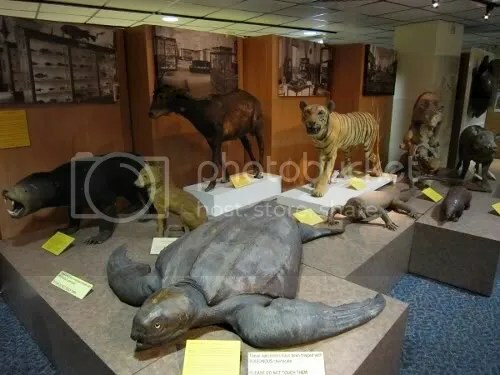 Read about our previous visits to the Singapore Philatelic Museum here and here. 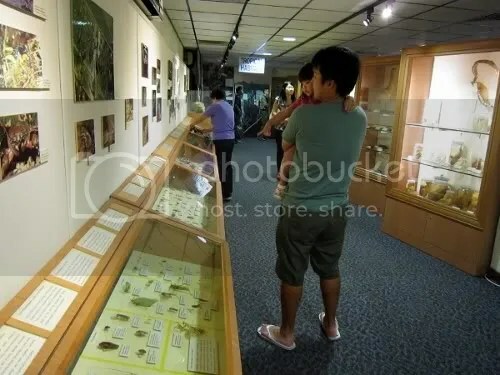 The Singapore Philatelic Museum Children’s Season 2012 Open House continues tomorrow, 3 June, from 9am to 5pm. 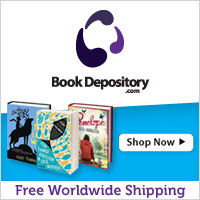 This entry was posted in Uncategorized and tagged books, children's season, museums, play on June 2, 2012 by delphine. 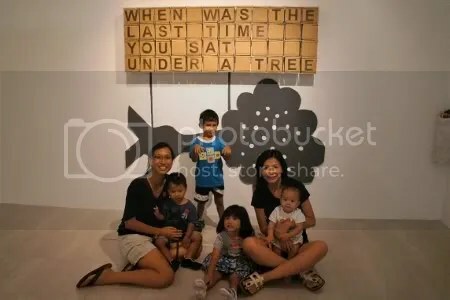 We went to Art Garden at Singapore Art Museum on Monday with Selena, her two boys and Vonnie and had such a blast! 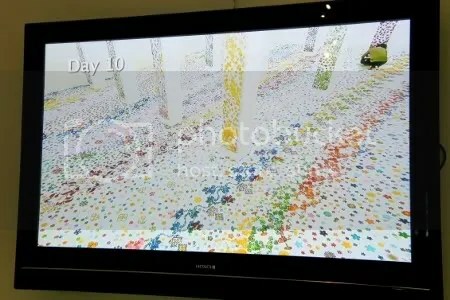 We have been going to Art Garden every year since it started and I think this year’s is a lot more interactive and hands-on, which is great for the kids. Anya got very excited when we passed Walter sitting in front of SAM while we were on the bus and as we were walking towards SAM at 8Q, she was happy to recognise the cheerful Dancing Solar Flowers which were also on display last year. 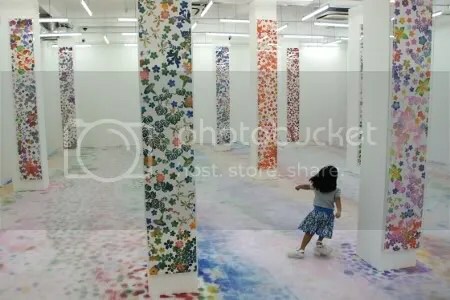 The first installation we explored was Echoes-Infinity-The Forest, a carpet of flowers created with special pigments that fade as visitors walk over them. Anya was quite taken with the idea that she had the ability to change the artwork and went dancing around the room trying to make as much of an impact on the flowers as she could. After removing the booties we had to wear to enter the room, we made our way up to the 3rd floor. There was a long mural called Kakhé spanning the 4 storeys of the stairs. 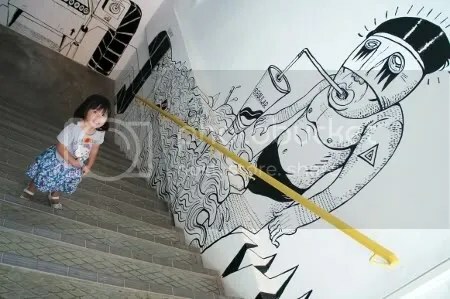 I thought it was rather strange-looking and somewhat disturbing because the figures didn’t have eyeballs but Anya liked it and asked to take photos with the mural. 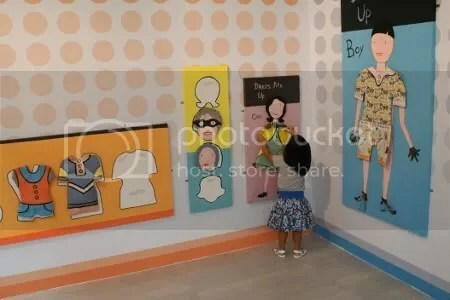 We spent quite a bit of time at Dress Me Up, another repeat from the previous Art Garden. It was Anya’s favourite from last year and she had a good time dressing the characters up. Adam also had fun sticking pieces on the cake and trying to chomp on them. I wish they would position everything lower though! It’s still quite difficult for the smaller kids to reach all the pieces. 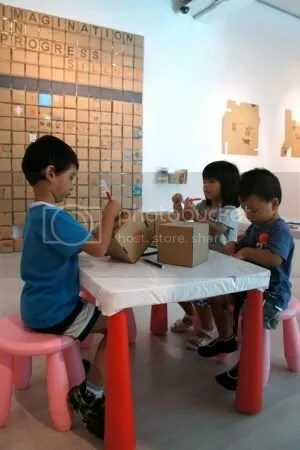 In the next room was The Art of Imagination by the same artist and the kids were quite eager to add their own drawings to the boxes. 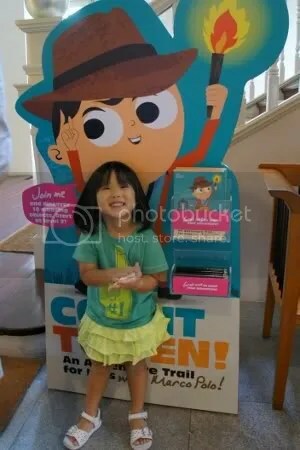 Adam was kept occupied by a young lady who was very charmed by him and she made him a box to play with and took photos of and with him. 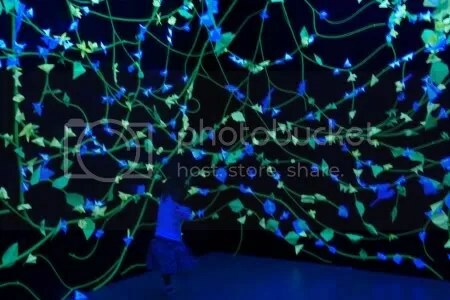 The kids loved the Reactive Wall and Let’s Dance which allowed them to express themselves through sound and movement. Anya was a bit self-conscious about speaking into the microphone even though she was quite fascinated by how the sounds made the pictures on the wall change and move. But we all enjoyed dancing and being silly and then watching our own performance. The dancing made us very tired! 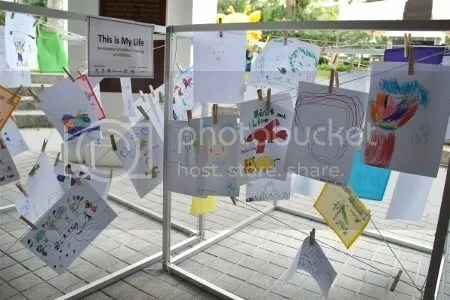 After that, we headed to the 4th floor to fold origami flowers for Grow the Garden in the Dark and to make friends with a giant 5QU1D! We made our way back down to level 2 to design our own clay flower magnets with everyday ordinary objects as inspired by Everyday Wonders. 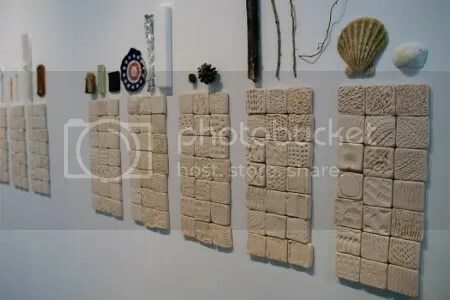 It’s a pity the kids couldn’t touch the clay shapes in the installation though! We then did some colouring and stamping at the Activity Room. 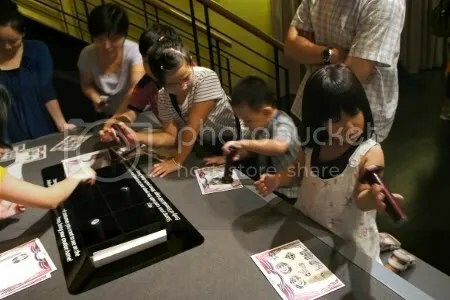 Finally, we had a few exhausting mad games at Ping Pong Go-Round, the donut-shaped ping pong table! 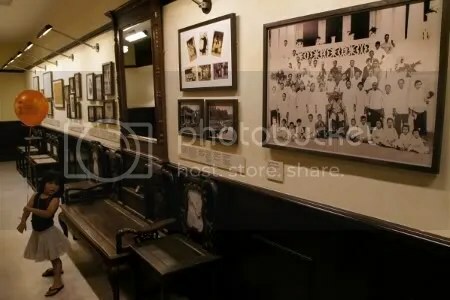 We have to go back again another one or two times because we didn’t manage to watch the short films and animations. 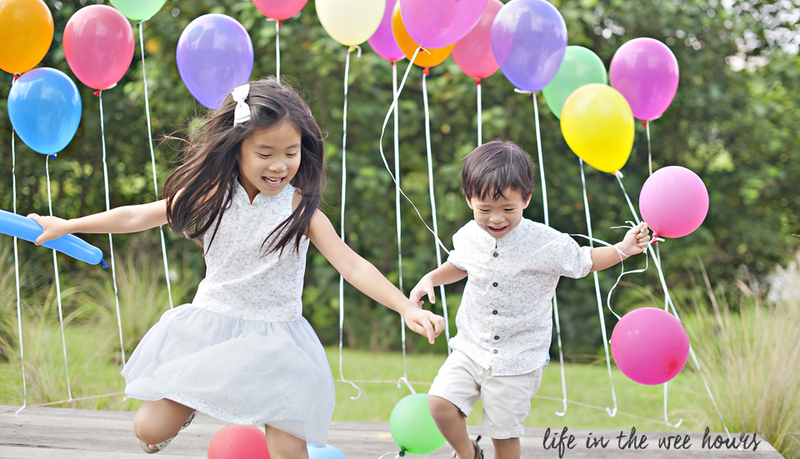 I think the little kiddos had so much fun and really want to make another trip too! 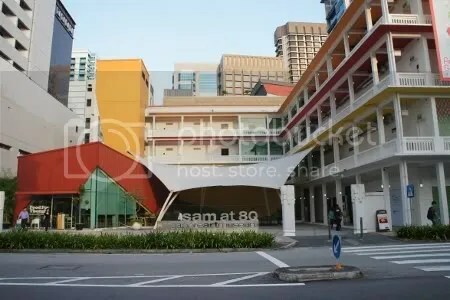 Check out Art Garden at SAM at 8Q from now until 12 August. 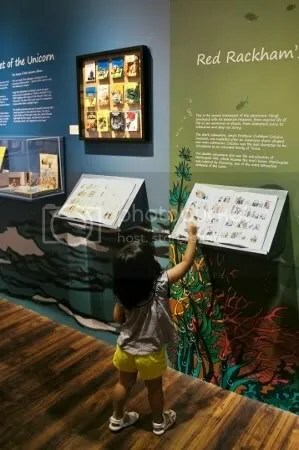 Admission is free for children below 6 years old and students. Adults pay $10. 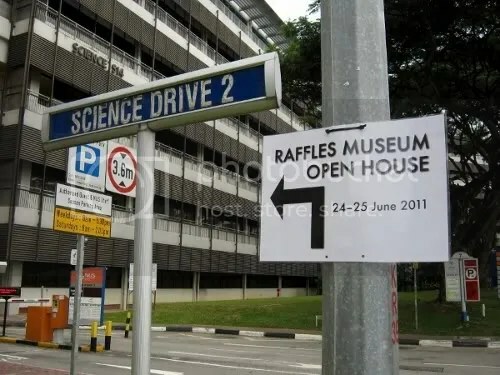 There is free admission every Friday from 6-9pm. 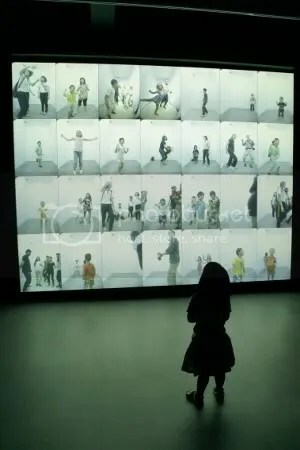 This entry was posted in Uncategorized and tagged art, children's season, museums, play on May 30, 2012 by delphine. 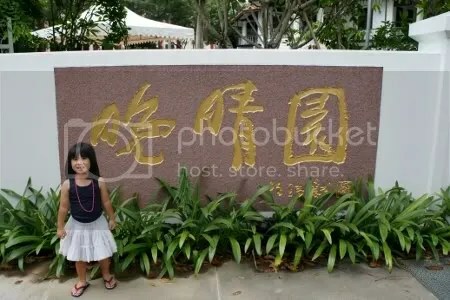 As part of Children’s Season 2012, Sun Yat Sen Nanyang Memorial Hall (晚晴园) had an Open House over the weekend so Anya and I made a trip there on Sunday. 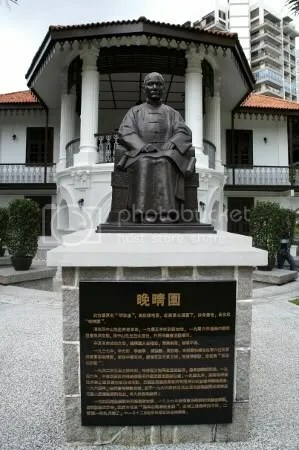 The villa served as the headquarters to Dr Sun Yat Sen’s revolutionary activities in Southeast Asia and was re-opened to the public last October after a year of renovation. 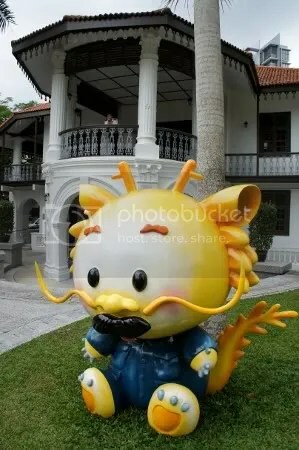 love the ‘stache on the Sun Yat Sen dragon! 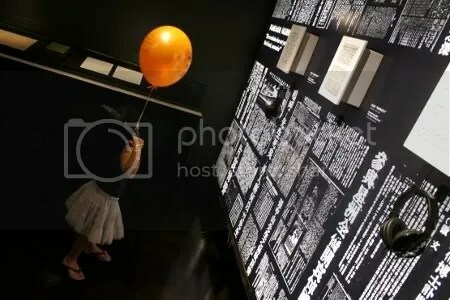 Before entering the memorial hall, Anya spent some time drawing a picture to contribute to the exhibition of children’s drawings on childhood. 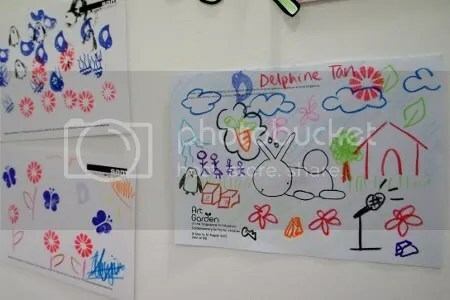 Her artworks are usually quite messy and abstract so I thought her drawing of herself under a rainbow was pretty well done. 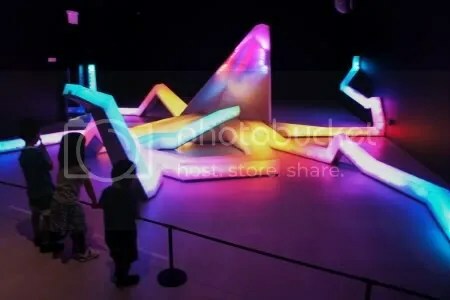 I don’t know what they are going to do with the picture when they are done with the exhibition but I would very much like to take it back! 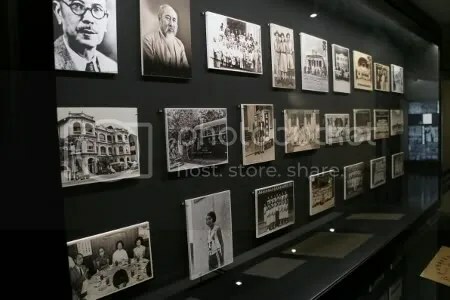 The memorial hall contains a comprehensive collection of photographs, paintings, letters and other artefacts on Dr Sun, his revolutionary activities and the impact on Singapore and the region. 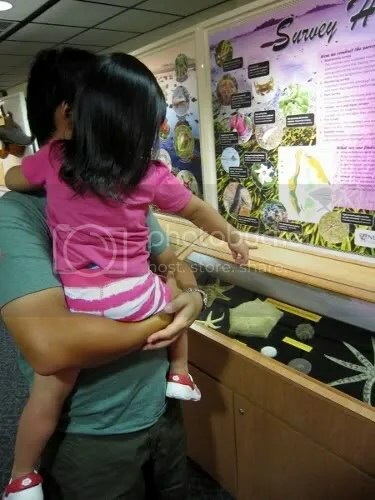 There are also multimedia and interactive displays. Since Anya had no idea who Dr Sun Yat Sen is, I could only interest her in some of the old and more unusual items. She liked being able to put on headphones to listen to a song about Dr Sun and looking at the giant painting of him surrounded by people. After our tour, we sat in on a storytelling session by Kamini Ramachandran of MoonShadow Stories. 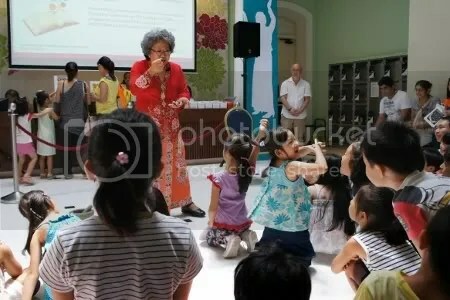 The two stories we listened to were very interesting but didn’t have anything to do with Dr Sun Yat Sen.
Before leaving, we played a memory game and won an activity booklet which contains relevant and appropriate activities for children visiting the Sun Yat Sen memorial hall. 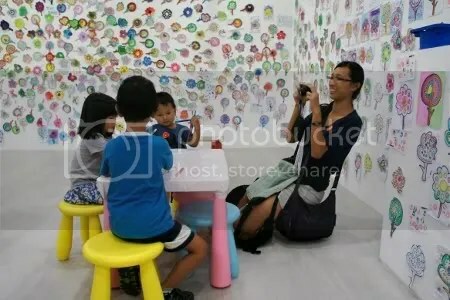 For the next Children’s Season, they should have the activities set up as stations throughout the galleries, e.g. 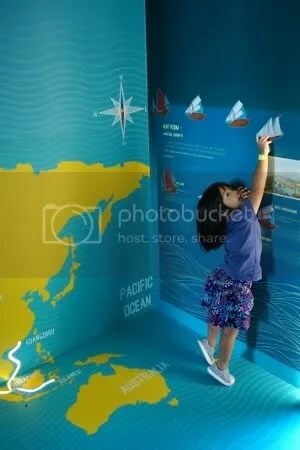 let kids dress up in the Zhong Shan suit that Dr Sun was always seen in, have a giant map where kids can pinpoint the various locations to which Dr Sun travelled to spread his revolutionary ideas, etc. 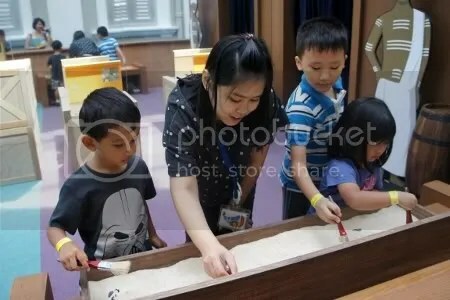 There’s free admission this weekend (2/3 Jun) from 10am-5pm and there will be some activities for children including photo-taking with photo boards and macaroni art. 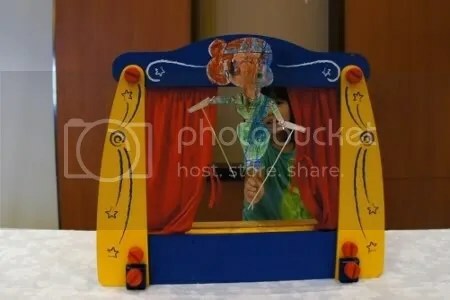 There are also activities such as puppet-making the following weekend. 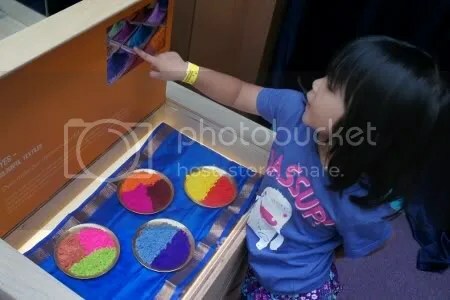 This entry was posted in Uncategorized and tagged anya, art, children's season, museums, outings on May 29, 2012 by delphine. 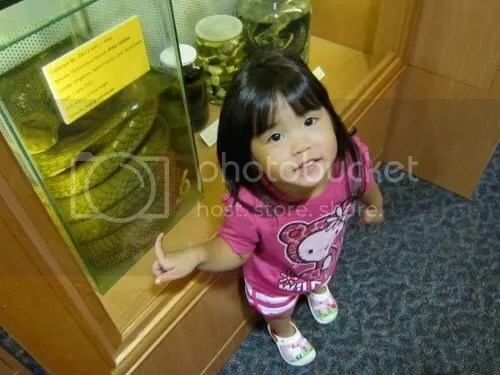 Anya is afraid of several creatures, such as cockroaches, lizards, rats, turtles, snakes and lobsters. 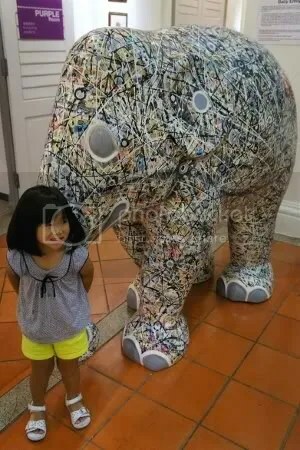 These and more are all found at Raffles Museum! I didn’t think she would like the museum very much but I wanted to go so I played the “but it’s my birthday!” card and dragged the two of them along with me. Fortunately, Anya was quite excited to walk around and look at all the insects and animals after we assured her that they were all very dead. In fact, the only thing she wasn’t too fond of was a large pair of water buffalo horns. 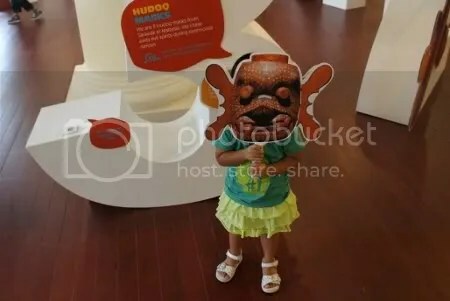 There were several activities going on for kids to take part in like a slideshow and quiz, face-painting, mask-making and button-making. 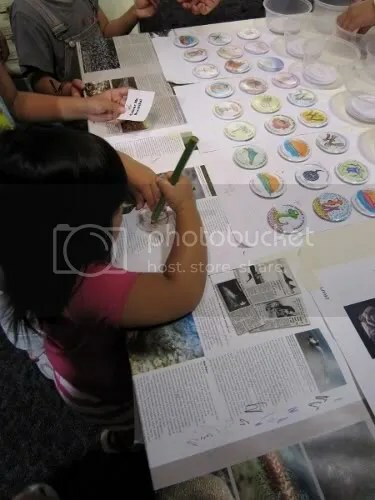 Anya chose a picture of bracket fungus to colour and make into a button. 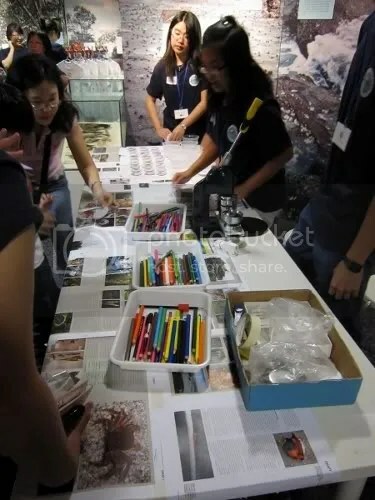 I was actually quite glad that each activity required a small donation so there wasn’t the situation of tons of children/ parents trying to take advantage and overwhelming the volunteers like at some other Children’s Season events. Overall, it was a fun visit and even Adrian had to admit that it was interesting. Heh. 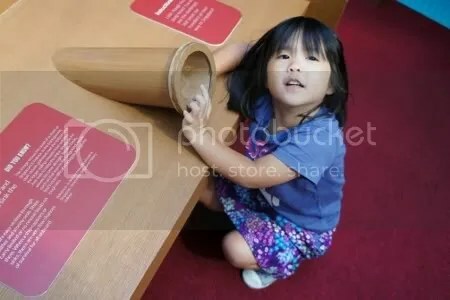 This entry was posted in Uncategorized and tagged children's season, museums, nature, outings on June 26, 2011 by delphine.